This is part one of a four-part series on what I believe are some of the best wine bars in Barcelona. As you may have already surmised, this series is four-parts because I have a top four and not a top ten or even a top five. Kind of a weird number I know, but once the series is complete I think you'll be jonesing for some great tapas, a flute full of Cava and calling your travel agent to book you on the next flight to Barcelona. 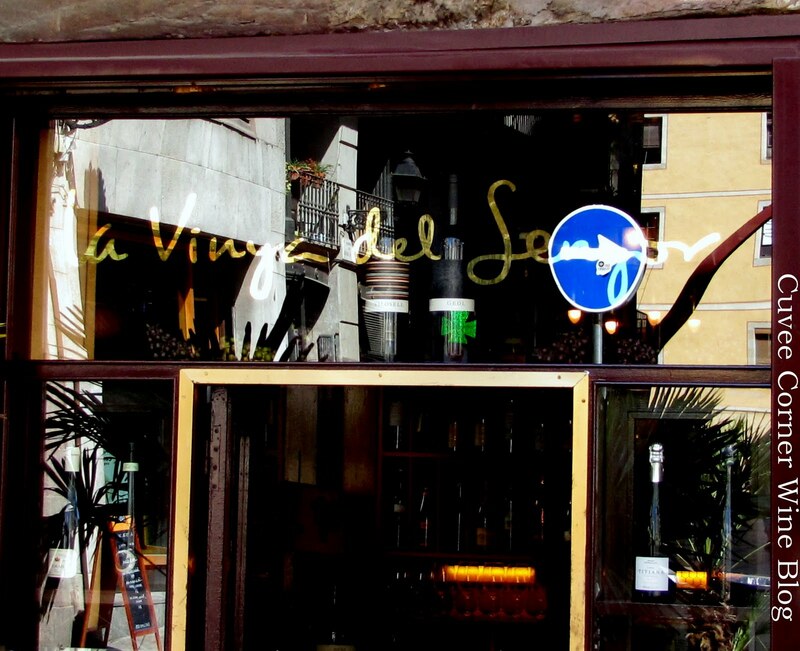 Regarding La Vinya del Senyor, I think you'll be very impressed with the depth of the wine list this wine-bar has to over offer the adventurous vino-sapiens traveling abroad. You can try to squeeze into side the tiny wine bar itself or take a bottle upstairs, but my preference is to uncork a bottle or just grab a glass just outside to the terrace go early afternoon for finding a seat] which lies in the shadow of Santa Maria del Mar [a great example of the Mediterranean Gothic style]. Which is worth taking a gander inside afterward. Oh, and if you happen to have the kids with you, bonus there is a Gelato shop just across the mini-plaza, where you can both toast to delights of living the Espania lifestyle one I really came to admire. This place is not really a restaurant, but they do have Tapas which tend to be on the expensive side of the equation, so show up thirsty and have a tasty snack. This is a place to graze on a few Marcona almonds, sip some lovely Cava and watch the world go by. But if getting a serious bottle of vino is more in your game plan, then you will likely be wowed, by the depth of their wine list and oh by the way wines from coveted Priorat region are in the reasonable range as they skip the dreaded three tier markup you see on U.S. shelves. And yes they serve grown up stems, there are no dalliances with the likes of Libby. 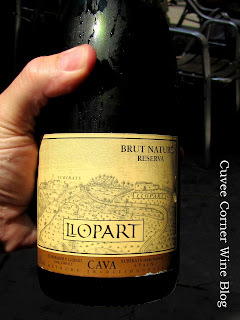 The bottle we enjoyed was the Llopart Brut Nature Reserva and oh-my this bubbly made me say wow. Made in a wonderful blend from the traditional the native grapes of Macabeo [30%], Xarel.lo [40%], Parellada [20%]. You may be wondering why it says "nature" on the bottle? Good question, it was explained to me this way, it's an indication on sparkling wine labels that Liqueur d' expedition [dosage] was not added [sweetness] after disgorgement of the of what is commonly referred to as the "mother" in Spanish Cava production. Because once the "mother" is gone the wine can no longer "age" thus it's not wise to hold onto Cava for long periods after it has been disgorged and the bottle corked. Thus you have a drink now and drink often sparkling wine, I'll lift a flute to that idea. In the glass, you'll find a shimmering pale straw-yellow colored core brimming with fine bubbles. The aromas as I remember it were very clean, with the perfect balance of delicate fruitiness and minerality. On the palate round apple, pear and lime flavors with a shade of spice, completely dry, the mousse is creamy, leading to a satisfying finish. This is a very versatile wine, ideal to take on just about enough any dish. It sells for about $15 euros or about $21 U.S., which I thought was a great deal for a Cava of this caliber. I gave this wine a score of 93 points and would highly recommend that you give it a swirl. Unfortunately, it appears that only the Rose is available stateside which is a shame. If you ever find yourself in Barcelona, a wonderful international city, give this place a swirl you'll be glad you did. Until next sip long and prosper, cheers!